After sliced bread, the next best thing is of course Infrastructure-as-Code. In Azure, this means using ARM templates to deploy your infrastructure automatically in a repeatable fashion. It allows teams to quickly create anything they want in any Azure resourcegroup they have access to. Azure allows you to use RBAC to limit the Resourcegroup(s) a team or individual has access to. But is this secure enough? Yes, .. and no. Yes, can you limit everyone to the resource(groups) they have access to. However, within that group they can still do whatever they please. Wouldn’t it be cool to also be able to limit what a team can do, even within their own resourcegroup? 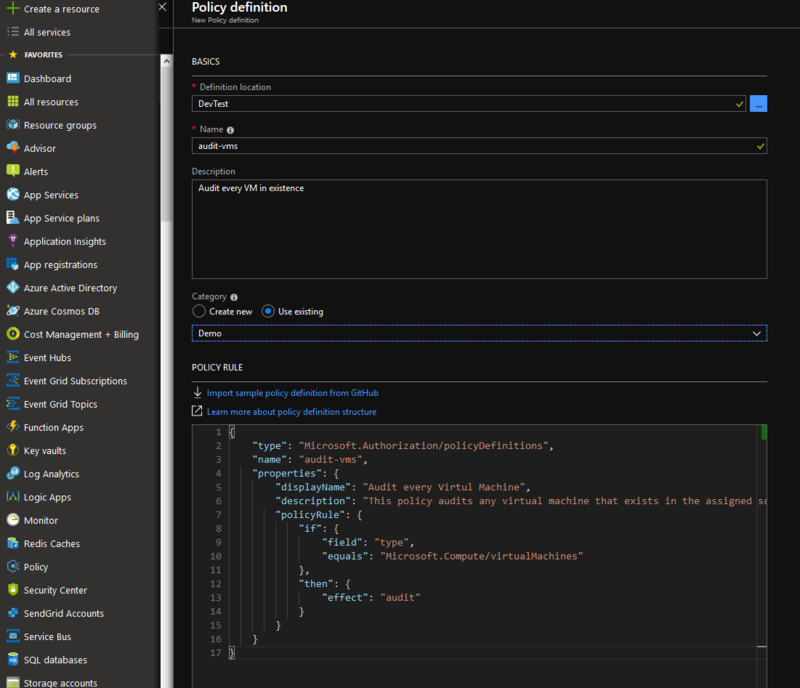 This is the first of a series of posts on Azure Policy, an Azure offering that allows you to define policies that allow or disallow specific configurations within your Azure subscription. In this post we will see how to define policies that inform us when a situation exists that we might rather not have. To be more concrete: we want to create an audit log entry whenever someone deploys a virtual machine. I am not a big fan of them and I want to know who is using VM’s to get a conversation going about how to move them to PaaS or serverless offerings. Every policy has a property type, that always has to have the same value. If you are familiar with ARM templates, you might guess that this allows the policy as a whole to be inserted into an ARM template. And this is correct, you can deploy Azure Policies as part of a subscription level ARM template. Next to the type, a name is mandatory and can be chosen freely. The third property describes the policy itself. The displayName and description speak for themselves and can be freely chosen. For the policyRule there are numerous possible approaches, but let’s start with a simple condition under the if property that ensures that this policies effect only triggers when it encounters any resource with a type of Microsoft.Compute/virtualMachines. Again, this relates to the resourcetype also encountered in ARM templates and references a namespace provider. Finaly the effect that we then want to to trigger is only an audit of anything that matches the if expression. This way we can view the compliance state of the resource this policy is assigned to and also see all events that violate this policy. Finally, clicking Save at the bottom of the page, registers the policy in the subscription at the top and makes it ready for use. In this view we must select the scope, including any exclusions if we want those. (Why would you?) Then you can select the Policy to apply, which you can search by name as I did or find in the category Custom left of the search box. After selecting the Policy an assignment name is mandatory and a description is optional. Filling these with a rationale for your policy will decrease the chance that others will simply remove it. Hit assign and put Azure to work on your policy assignment. After first assigning our policy, it’s compliance state will be set to Not started, this means that your policy has not been applied to existing resources yet. It will however be evaluated for every new resource that is deployed. Now after a while the compliance state of my policy changed from Not started to Non-compliant, indicating there were one or more resources violating the policy. Here it shows both a VM that existed before this policy was assigned (hbbuild001) and a VM that was created after assigning the policy (sadf…). Using this overview and the option to drill down to violating resources, it is easy to inspect on what is happening accros your subscriptions and get conversations going when things are happening that are not ideal. Here you can see all the events surrounding this Policy: it’s creation, but also every violation. Opening up the details from this violation allow you to use this event as a blueprint for creating alerts for any other new violation. If you are looking for more things to do with Azure Policy, check out the links below. Also, I hope to write another blog on Azure Policy to show how to block or automatically fix deployments that violate your policies.